Gold Coast Center for Veterinary Care is pleased to offer physical rehabilitation for our patients. Physical rehabilitation aims to increase your companion animal’s physical mobility to help return them to an optimal level of function. Just like with humans, movement is important to maintain or increase muscle control and strength, decrease stiffness of tendons and muscles and increase the stability of joints. Our highly-trained Rehabilitators and staff are committed to improving the physical and psychological well-being of your companion animal to help improve over-all quality of life. Therapeutic Exercise - These are manual therapies that target affected muscles, nerves and other structures to help restore function. Exercises increase balance, proprioception, range of motion, muscle mass, muscle strength, promote weight bearing, and normal gait patterns. Strength, coordination, flexibility and balance therapies - We utilize tools such as exercise balls, rocker and wobble boards. Cryotherapy - We utilize cold packs to reduce pain and inflammation, and decrease both surface and deep tissue bleeding. Heat therapy - Heat therapy utilizes moist heat packs to help decrease pain, alleviate muscle spasms, increase soft tissue elasticity/flexibility and decrease stiffness due to arthritis. Heat is most commonly applied before therapeutic exercises or stretching activities are performed to loosen and relax muscles. Neuromuscular Electrical Stimulation (E-Stim) - E-Stim uses low levels of electrical current to stimulate nerves and muscles. This can block pain signals, reduce swelling, strengthen muscles and retrain the nervous system. It is often used after orthopedic surgery, in cases of spinal cord damage, or for muscle strengthening. TENS is a specific form of E-stim that blocks pain pathways in the nervous system and is often used postoperatively or for chronic pain. Therapeutic Laser Therapy - Laser therapy is used to improve wound healing, reduce post-trauma swelling, and facilitate long lasting pain relief by stimulating the release of your dog’s own pain killing chemicals like endorphins. Therapeutic Ultrasound - Therapeutic ultrasound is the use of sound waves to penetrate through tissue. These waves produce a localized heating effect in superficial and deep tissues. This heating helps to increase tissues and muscle elasticity, circulation, joint mobility, decrease pain and aids in breaking up scar tissue. Massage Therapy - Therapeutic massage aids in decreasing pain, stiffness, edema, muscle knots/spasms, scar tissue, and increases circulation and helps to promote relaxation. Underwater Treadmill Therapy - Underwater Treadmill Therapy is very beneficial to a wide variety of patients. The water buoyancy counteracts gravity, reducing concussive forces on the body. This allows the patient to walk comfortably in the water with decreased pressure on the joints. Water resistance aids in increasing muscle mass, muscle strength, circulation/blood flow, cardiovascular endurance, range of motion and weight bearing on an affected limb(s). The treadmill water is also heated to reduce stiffness and pain thus, further ensuring patient comfort. In-Patient Rehabilitation. Having an injured companion animal can be stressful. In-house rehabilitation can give you peace of mind that during your companion animal’s stay, our CCRP will be working diligently to make sure your companion animal’s individual needs are met while they are recovering. Out-Patient Rehabilitation. Physical Rehabilitation can sometimes take an extended period of time. West Hills Animal Hospital offers convenient drop-off rehabilitation sessions so your companion animal may receive continued professional rehab treatments for as long as they need. Mobile Rehabilitation Services. Let the Rehabilitation team come to you! We offer in clinic and at home rehabilitation for those patients that are unable to come to us. Home Exercise Program. 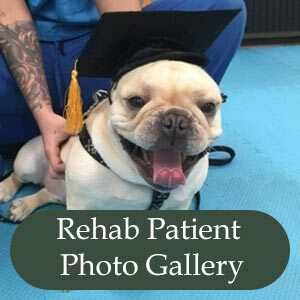 A home exercise program (HEP) is where our Certified Canine Rehabilitation Practitioner (CCRP) creates a customized comprehensive exercise program for your companion. All HEP’s are tailored to meet specific patient needs and allows you to be the rehabilitator at home. During your discharge, our rehabilitator will instruct/demonstrate proper exercise techniques as well as give you a detailed list of all exercises. Fitness. Whether seeking to increase cardiovascular endurance, muscle strength, agility performance or just wanting to give an animal time away from home in a fun stimulating environment, having an exercise program can help improve overall quality of life. Weight Loss Program. Weight plays an important role in rehabilitation. Excess weight places increased stresses on the body making overall health and quality of life limited. It can also cause complications after surgery. We offer a 30 day in-house weight loss program that consists of structured diet and exercise plans for the individual patient to get them back to a healthy weight. Wheelchairs. "Carts" are great options for animals with limited mobility. The Rehabilitation Department provides professional cart measuring and assembly for all types of patients. Orthopedic Bracing and Adaptive Devices - Joint braces and other adaptive devices can provide stability and support as well as correct or promote a more normal gait pattern.